For nearly 100 years, the Los Angeles County Flood Control District (District) has provided flood risk management and water conservation for much of Los Angeles County. The Los Angeles region is very unique because erosive mountains are so close to the coast. Erosion is when loose soil, rocks, and debris (called “sediment”) are carried downstream and normally occurs when it is raining. Even though it doesn’t rain very often in Los Angeles, when it does, it can be very intense. 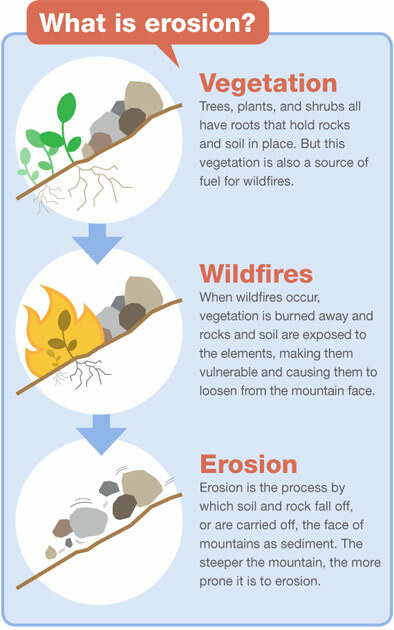 Wildfires, which are common to the Los Angeles region, greatly increase the amount of sediment that erodes and flows from the mountains. After a wildfire, eroded sediment along with fire debris (such as dense ash and charred vegetation) flow into the flood control system when it rains. The duration and intensity of the rain, as well as the severity of the fire on an area, determine the amount of sediment that is produced. Intense storms in a burned watershed could cause catastrophic property damage. The first five years after a fire are the most critical for sediment management. Typically by years four and five, vegetation in the burned areas significantly recovers and the potential for sediment flows is reduced by about half of what it was immediately after the fire. It takes about 10 years for a burned area to recover to its pre-fire condition. 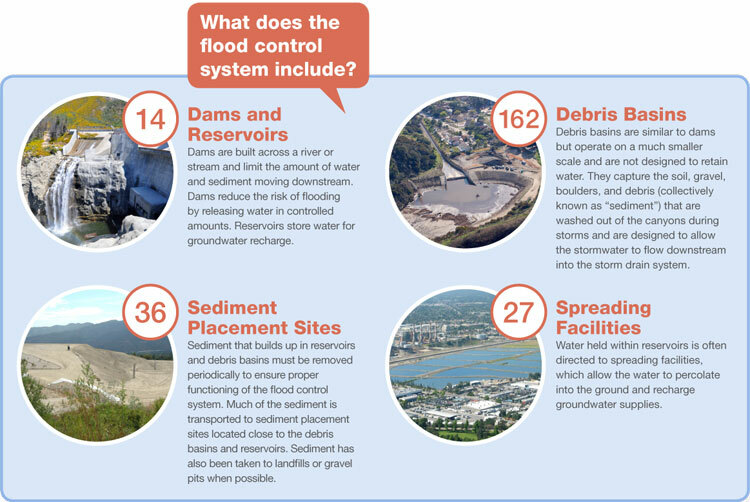 The District manages a flood control system of dams, debris basins, and other drainage infrastructure, which reduces risk of floods and debris flows for downstream communities. Effective sediment management requires the regular removal of sediment that deposits within District facilities. In 1915, the Los Angeles region experienced a disastrous flood that claimed lives and severely damaged property. To prevent such tragedy from happening again, the California State Legislature adopted the Los Angeles County Flood Control Act, which established the Los Angeles County Flood Control District and empowered it to provide flood risk management and water conservation, in addition to recreation and habitat restoration within its boundaries. To reduce flood risk and conserve stormwater runoff while improving water quality, providing recreation opportunities, and enhancing open space where feasible.